Azul is planning more rapid expansion in 2012 despite the expected slowdown in the growth curve of the overall Brazilian market. The low-cost carrier, which so far this year has launched 14 new destinations while adding 17 aircraft, sees plenty of opportunities to further stimulate demand on secondary domestic routes where there is relatively limited service. Azul is now Brazil’s third largest domestic carrier after Gol and TAM. 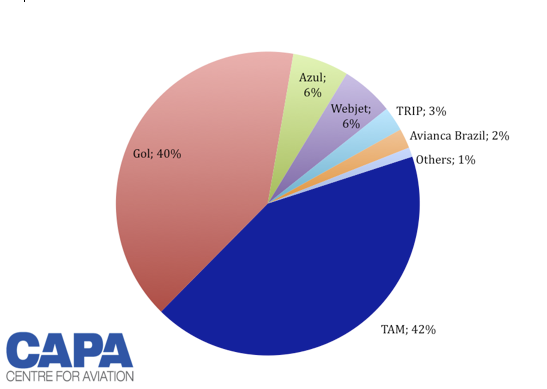 Azul accounted for 8.4% of domestic RPKs through the first three quarters of 2011, according to data from Brazilian civil aviation authority ANAC. In 3Q2011, Azul’s share of the Brazilian market exceeded 9% for the first time. Azul chairman David Neeleman told CAPA along the sidelines of the ALTA Airline Leader Forum in Brazil earlier this month that he expects the carrier will capture 15% of the market by the end of 2012. He says Azul’s capacity in 2012 will increase 20% to 25% as Azul adds another 16 aircraft, giving it a fleet of at least 65 aircraft (19 ATR 72-600s and 46 E190/E195s) by the end of next year. Note: Market share based on scheduled domestic RPKs flown by all Brazilian carriers. TAM CEO Libano Barroso told CAPA at the Forum that TAM, which has been adding domestic capacity at a 12% clip so far this year, plans to only expand by 4% in 2012. Gol CEO Constantino de Oliveira Junior told CAPA that Gol’s group capacity will increase in 2012 by at most 4%, with most of the additional capacity coming at new subsidiary Webjet as its B737-300s are replaced with larger B737-800s. Through the first three quarters of this year, Gol’s domestic capacity was up by 5% while Webjet’s capacity was up 10%. Mr Oliveira expects the overall Brazilian domestic market to grow by 7% to 9% in 2012, while Mr Barroso projects growth in the 8% to 12% range. This marks a significant slowdown compared to the 24% domestic RPK growth recorded in 2010 and the 19% growth through the first three quarters of 2011. While Gol and TAM are planning only modest capacity increases next year, Azul is joined by smaller Brazilian carriers TRIP and Avianca Brazil in planning significant capacity expansion. As a result, this trio will account for most of the expected high single-digit growth in Brazil next year and will grow their market share at the expense of Gol and TAM. But the market leading positions of Gol and TAM will not at all be threatened given their significantly larger size and the fact Gol plans to complete its acquisition of Webjet in mid-2012. Mr Neeleman says Azul in 2012 will continue to grow faster than market leaders Gol and TAM as it focusses on secondary domestic markets which remain relatively underserved. Since launching in Dec-2008, Azul has focussed primarily on stimulating demand on routes which previously had little or no service, believing Brazil’s main carriers were not positioned to fully exploit the rapid growth in Brazil’s secondary cities. “We decided to focus on markets really starved for service,” Mr Neeleman explains. Mr Neeleman says the carrier plans to add in 2012 about 10 destinations, all of which are secondary cities that have little or no air service and high fares despite having populations of between 500,000 people and one million. Gol and TAM lack the aircraft to penetrate the smaller markets because Gol’s smallest aircraft is the B737-700 while TAM's smallest aircraft is the A319. “Whenever you have a duopoly and the duopoly only have big airplanes there are a lot of things not being done,” Mr Neeleman says. In other countries, cities with populations of 500,000 to one million people typically have significantly more service. In Brazil, the country is so vast and there are so many secondary cities, many airports have been relatively neglected as the main carriers have focussed primarily on trunk routes. Mr Neeleman, who was the founding CEO of JetBlue before launching Azul, says he decided to launch an LCC in Brazil because it was clear the Brazilan market was underserved. He says based on the size of Brazil and its GDP he thought the Brazilian aviation market could easily triple in the size, from 50 million to 150 million passengers annually. While the Brazilian market has already grown by about 50% since mid-2009, Mr Neeleman sees an opportunity to grow the market by another 70 million passengers p/a. Mr Neeleman points out that 55% of Azul’s routes currently have no competition, proving that Azul’s strategy of opening up new markets through low fares and relatively small aircraft has so far worked. Mr Neeleman expects Azul will start to encounter competition in a higher portion of its routes but says most of overlap will be with fast-growing Brazilian regional carrier TRIP rather Gol and TAM. TRIP, which also operates a fast-expanding fleet of ATR tuborprops and Ejets including smaller versions of both types than Azul, focusses primarily on thin point-to-point markets. While they also follow the LCC model, the network strategy at Gol and Webjet is much different than Azul because so far they have focussed primarily on trunk routes with larger aircraft. “We’ll start crossing with TRIP next year. But we have a really strong brand. We are not concerned about it,” Mr Neeleman says. Azul currently serves 42 destinations, up from 28 at the start of this year. Azul was originally planning to serve 50 destinations by the end of 2011 but Mr Neeleman says Azul has decided to postpone the launch of four additional destinations until Feb-2012 in order to accommodate increased demand on some of its existing routes. 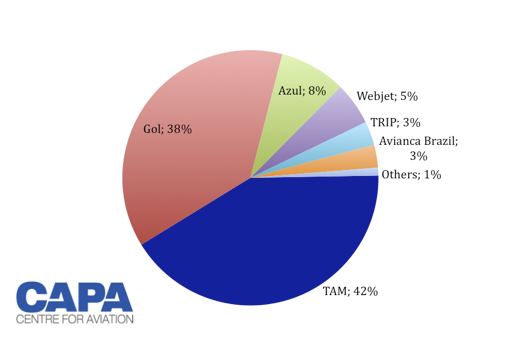 As a result, Azul now plans to end 2011 with a network of 46 domestic destinations, which will increase to 50 in 1Q2012 and to about 56 by the end of 2012. Mr Neeleman has repeatedly said that international services are not in Azul’s business plan because there are so many opportunities in the domestic market, where growth can be pursued with less complexity and risk compared to opening up international markets. “There’s an opportunity [for international] but not for five plus years into the future,” Mr Neeleman says. The expected expansion of the domestic network in 2012 is made possible by net fleet growth of 16 aircraft. Azul currently has a fleet of 43 aircraft consisting of 10 E190s, 24 E195s, eight ATR 72-200s and one ATR 72-600. Six more aircraft – four E195s and two ATR 72-600s – are expected to be delivered by year-end. Mr Neeleman says Azul plans to take 16 ATR 72-600s next year but will return all eight of its ATR 72-200s. Azul only took all eight of its ATR 72-200s earlier this year but Mr Neeleman says they were all added on short-term leases and were used to accelerate growth in regional markets ahead of the delivery of its new ATR 72-600s. Azul in mid-2010 placed orders for 20 ATR 72-600s as part of a new strategy to start penetrating thin short-haul markets. Mr Neeleman says Azul will also take eight new E195s next year. Azul has been taking Ejets at an average clip of roughly one aircraft per month since launching services three years ago. The carrier is now committed to continue adding E195s at a rapid clip through 2014. While all 20 of the ATR72-600s Azul ordered last year will be delivered by early 2013, Mr Neeleman says Azul holds options of the new type through 2014. Mr Neeleman reveals that “over the next 12 months” Azul will “look at” its fleet requirement for 2015 and beyond. Mr Neeleman is particularly interested in re-engined Ejets, which Embraer is now planning to launch with an anticipated entry into service in 2017 or 2018. He says Azul may hold off in acquiring additional E195s until the re-enginged E195 is available because the 15% anticipated improvement in fuel burn will be a huge benefit to Azul given that fuel is by far its largest cost. Embraer is also looking at introducing a new wing and slightly extending the fuselage of the E195. Mr Neeleman does not expect a significant extension, explaining the E195 is already longer than the A320 and if stretched would accommodate at most two additional rows. Azul is happy with the current size of the E195, which Azul configures with 118 seats in single-class configuration. Mr Neeleman says Azul is not interested in acquiring larger aircraft, preferring to increase frequencies rather than add a third aircraft type as demand in some of its core markets increases. Mr Neeleman sees Azul will continue to expand at its base at Campinas-Virocopos Airport outside Sao Paulo but will also add capacity next year at other cities including Belo Horizonte. While Campinas is only located about 100km from Sao Paulo and is seen by many as an alternative airport for Brazil’s largest city, Mr Neeleman says Azul has so far focussed primarily on the local Campinas market. Demand in Campinas, which is a large city in itself and was underserved prior to Azul, continues to increase. But Mr Neeleman also sees opportunity to start attracting passengers which are now using Sao Paulo’s two heavily congested and more expensive airports, Congonhas and Guarulhos. He says of Azul’s Campinas-origin passengers, almost 90% are now from Campinas while only 10% are now from Sao Paulo. Campinas-Viracopos is now Brazil’s 10th largest airport but it is one of the world’s fastest growing. ALTA figures show Campinas handled 5 million passengers in 2010 and is projected to nearly double its throughput by 2014 to just under 10 million passengers. Unlike Congonhas and Guarulhos, Campinas-Viracopos is not yet considered congested. But Mr Neeleman says the airport is “getting there” and Azul is now working with authorities to improve the utilisation of the airport’s only runway. There are currently about 120 departures per day at Campinas, which is also a base for TRIP and has smaller operations from Gol and TAM. Campinas is also the main cargo airport for the Sao Paulo area and has started to attract some international passenger carriers, including Portugal’s TAP and Uruguay’s Pluna – both of which launched services to the airport last year. Mr Neeleman and other Brazilian carrier executives are now fighting a proposal to introduce a tax on transit passengers at Campinas along with other Brazilian airports which could impede demand and curtail growth. While it is an LCC, Azul embraces transit passengers, using Campinas particularly for connections between short-haul turboprop destinations and its jet network, which spans all of Brazil. Brazil’s carriers including Azul are also now lobbying against some aspects of a Brazil’s plan to privatise three major airports, including Campinas. Mr Neeleman is concerned the tenders as currently outlined will lead to an increase in airport fees. Azul and other Brazilian carriers have also initiated a campaign for lower jet fuel prices. The relatively high of price of fuel in Brazil is seen as a major impediment to growth. Even though it is a large oil producing country, Brazil has higher jet fuel costs than the US. Mr Neeleman used the ALTA Forum to speak with IATA director general Tony Tyler as well as executives of Gol and TAM about the fuel cost issue. Rising fuel costs, however, have not kept Azul from turning profits –which have eluded larger Brazilian carriers in recent months. Mr Neeleman says Azul this year for the first time in its brief history has been in the black. High load factors have helped Azul outperform most of its peers. Through the first three quarters of the year Azul’s average load factor was 82%, compared to the Brazilian industry average of 71%. Mr Neeleman says Azul also has not seen its yields drop in 2Q2011 and 3Q2011 like Gol and TAM, which both reported significant weaker yields despite the rise in fuel prices. “We’ve done a lot better than they have. We’re kind of isolated,” Mr Neeleman says. Mr Neeleman had been preparing Azul for an initial public offering but he says right now an IPO is not being contemplated given the condition of the financial markets. “The markets are closed. We don’t need the money,” Mr Neeleman says, adding that all of Azul’s aircraft deliveries for the next few years are also already financed. As the Brazilian market starts to show some signs of overheating, Mr Neeleman remains extremely optimistic. By any measure, Azul is off to a successful start. As it turns three years old, Azul is already well ahead of its original plan for fleet and network expansion, market share and profitability. Mr Neeleman, who was born in Brazil and was always interested in the Brazilian market, is rightly proud of what Azul has accomplished in an incredible short period of time. Azul could even prove to be the project which satisfies Mr Neeleman’s hobby of launching high profile airlines, so much so that he may finally start considering a well-deserved retirement (the airline industry veteran has an impeccable track record of identifying profitable niches in an otherwise crowded space). “I’m done with the airline business,” Mr Neeleman responded when asked by CAPA in an interview if he could potentially be enticed to launch an LCC in another Latin American market. This is the first of a series of analysis articles to be published over the next several days on Brazil’s leading airlines. CAPA was recently in Brazil for the ALTA Airline Leader Forum.